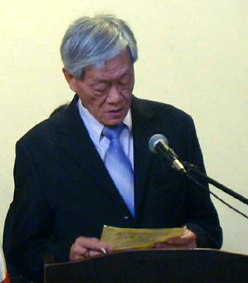 Lee Kuei-shien (1937) se graduó del Instituto de Tecnología de Taipei. Comenzó a escribir poesía en 1953, ingresó como miembro de la Academia Internacional de Poetas en Inglaterra en 1976 y formó parte de los que establecieron el PEN Club de Taiwán en 1987 del que fue electo vicepresidente y luego presidente. Sus poemas han sido traducidos y publicados en Japón, Corea, Canadá, Nueva Zelanda, Holanda, Yugoslavia, Rumania, India, Grecia, España, Mongolia, Rusia, Cuba y Chile. Su obra publicada incluye Poemas completos, en seis volúmenes, 2001; Ensayos completos en diez volúmenes, 2002; Poemas traducidas, en ocho volúmenes, 2003; Antología de la poesía europea, en veinticinco tomos, 2001-2005; Serie de poesía de élite, en diecinueve tomos, entre otros. Ha sido distinguido con el Mérito del Poeta Asiático, Corea (1994), el Premio Rong-hou al Poeta Taiwanés (1997), Poeta del Mundo del año 1997, Poetas internacionales, India (1998), Premio Poeta del Milenio, Academia Internacional de Poetas, India (2000) Premio Literario Lai Ho y Premio de la Cultura del Primer Ministro, ambos en Taiwán (2001). También recibió el Premio Michael Madhusudan concedido por la Academia Michael Madhusudan (2002), el Premio de Literatura Wu San-Lien (2004), la Medalla al poeta de la Fundación Cultural Mongola (2005), la Medalla de Oro Gengis Khan por el 800 Aniversario del Estado Mongol (2006), el Premio Oxford para Escritores de Taiwán (2011), el Premio Literatura Corea (2013), el Premio Literario Kathak de Literatura, Bangladesh (2016), el Premio Literario "Naim Frashëri" de Macedonia (2016), y el "Trilce de Oro" de Perú (2017). Ha participado en los festivales internacionales de poesía llevados a cabo en Corea, Japón, la India, Mongolia, el Salvador, EEUU, Nicaragua, Cuba, Chile, Bangladesh, Macedonia y Perú. Ha sido nominado tres veces como candidato al Premio Nobel de literatura, por la Academia de Poetas Internacionales y Grupo de Poesía en 2001, 2003 y 2006, respectivamente. Lee Kuei-shien(b. 1937)began to write poems in 1953, became a member of the International Academy of Poets in England in 1976, joined to establish the Taiwan P.E.N. in 1987, was elected as Vice-President and then President, and served as chairman of National Culture and Arts Foundation from 2005 to 2007. Now, he is the Vice President for Asia in Movimiento Poetas del Mumdo(PPdM). His poems have been translated and published in Japan, Korea, Canada, New Zealand, Netherlands, Yugoslavia, Romania, India, Greece, USA, Spain, Brazil, Mongolia, Russia, Latvia, Cuba, Chile, Nicaragua, Bangladesh, Macedonia, Turkey Poland, Serbia, Portugal,Malaysia and Italy. Published works include “Collected Poems” in six volumes, 2001, “Collected Essays” in ten volumes, 2002, “Translated Poems” in eight volumes, 2003, “Anthology of European Poetry” in 25 volumes, 2001~2005, “Elite Poetry Series” in 27 volumes, 2010~2017, and others. His poems in English translation include “Love is my Faith, 1997”, “Beauty of Tenderness, 2001”, “Between Islands, 2005”, “The Hour of Twilight, 2010”, “20 Love Poems to Chile, 2015” and “Existence and Non-existence, 2017”. The book “The Hour of Twilight” has been translated into English, Mongol, Romanian, Russian, Spanish, French, Korean, Bengali, Albanian, Serbian, Turkish, and Macedonian languages. Awarded with Merit of Asian Poet, Korea(1993), Rong-hou Taiwanese Poet Prize(1997), World Poet of the Year 1997, Poets International, India(1998), Poet of the Millennium Award , International poets Academy , India(2000), Lai Ho Literature Prize and Premier Culture Prize , both in Taiwan(2001). He also received the Michael Madhusudan Poet Award from the Michael Madhusudan Academy, India(2002), Wu San-lien Prize in Literature(2004), Poet Medal from Mongolian Cultural Foundation(2005), Chinggis Khaan Golden Medal for 800 Anniversary of Mongolian State(2006), Oxford Award for Taiwan Writers(2011), Prize of Corea Literature(2013), Kathak Literary Award of Bangladesh(2016), Literary Prize "Naim Frashëri" of Macedonia(2016), "Trilce de Oro" of Peru(2017). He was nominated by International Poets Academy and Poets International as a candidate for the Nobel Prize in Literature in 2002, 2004 and 2006, respectively.